Most people who are not keen on history do not realize America fought against Great Britain not once, but twice. Less than 30 years after the Revolution, the Americans took on the British again, in the War of 1812, over freedom of the high seas and other issues. A near fatal event for United States during that conflict came in August, 1814, when the Brits torched Washington, D.C., causing widespread monetary chaos in the face of economic and political uncertainty. Hoarding of precious metals became commonplace. As a result, very little gold and silver was deposited at the U.S. Mint for conversion into coinage for the remainder of 1814 and well into 1815. As news spread in 1815 of an armistice between the warring nations, gold and silver began trickling into the Mint. Late in 1815, enough silver was on hand to resume production of the half dollar. Mint staff found a leftover die pair from 1812, punched a 5 over the 2, and coined 47,150 half dollars, by far the fewest of Capped Bust Half Dollar series up until 1836. Should you be fortunate enough to own an 1815 half dollar, you can point out to envious onlookers that its scarcity is directly connected to one of the darkest moments in United States history. All half dollars dated 1815 are of the 1815/12 overdate variety. 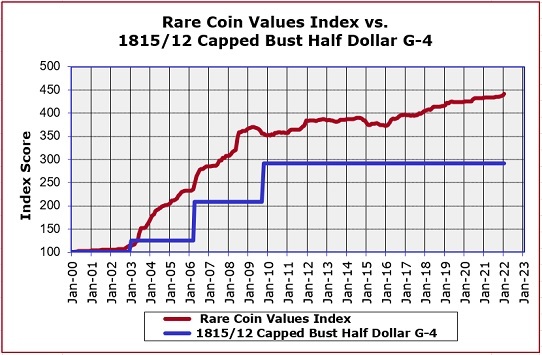 Despite its lofty status as a scarce relic from the War of 1812 era, the 1815 half dollar (blue line in graph above) has slightly underperformed the Rare Coin Values Index (red line) as a whole. The Index measures the composite percent change since Year 2000 of a representational group of 87 rare US coins, the purpose of which is to understand the strength and direction of the overall rare US coin market. The 1815/12 Capped Bust Half Dollar is one of the coins tracked in the Index. The Index is updated every month.